Connie Klein, NP is a Instructor in the Department of Surgery at McGovern Medical School at The University of Texas Health Science Center at Houston (UTHealth). Connie primarily treats adult patients. 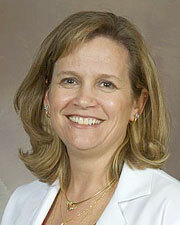 She focuses on treating patients personally with respect and a caring attitude. Connie is an active member of several professional organizations including: American Society for Metabolic and Geriatric Surgery, American Association of Nurse Practitioners, Texas Association for Bariatric Surgery and Society of American Gastrointestinal and Endoscopic Surgeons. When Connie is not caring for her patients, she enjoys spending time with family, snow skiing, mountain biking and hiking.